A MOS-FET power amplifier provides 25/10W of stable output power. A one piece, aluminum chassis helps to keep the transceiver cool and provides durable long-lasting construction. The IC-2200E/-T retains a familiar user interface to the IC-2100. The large tuning dial provides easy access to active channels even without looking at the front panel. Secondary functions are easily recalled by holding the appropriate button. With a total of 207 alphanumeric memory channels, Icom’s exclusive DMS system allows you to scan selected memory banks by simply adding and deleting bank links. 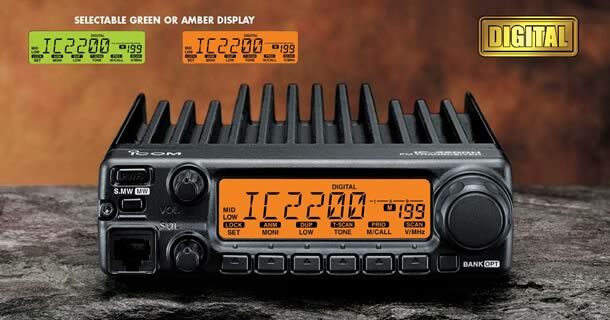 The IC-2200E/-T contains 50 CTCSS and 104×2 DTCS encode/decode plus tone scan functions. The “pocket beep” feature gives you an audible and visual indicator of an incoming call. Spurious emissions : -70dBc ypical. Remote control microphone with keypad backlighting. Same as supplied. DTMF microphones with keypad backlighting. Allows you to connect a regular 8-pin microphone. Provides DTMF decode capability with code squelch and pager operation. Provides digital voice and data capability at 4.8kbps (Voice + Data) with voice scrambler capabitity. For quick and easy programming of memories, etc.